Winter often makes us want to order-in instead of heading to the grocery store for those missing ingredients. We crave the ethnic foods that are hot and ready for us to eat, delivered quickly to our house. Butter Chicken is one of those great meals that the whole family loves at dinnertime. But take-out can often have excessive amounts of fats and sugars. What if you could get the same satisfaction and feel good about it, with little effort? You can! 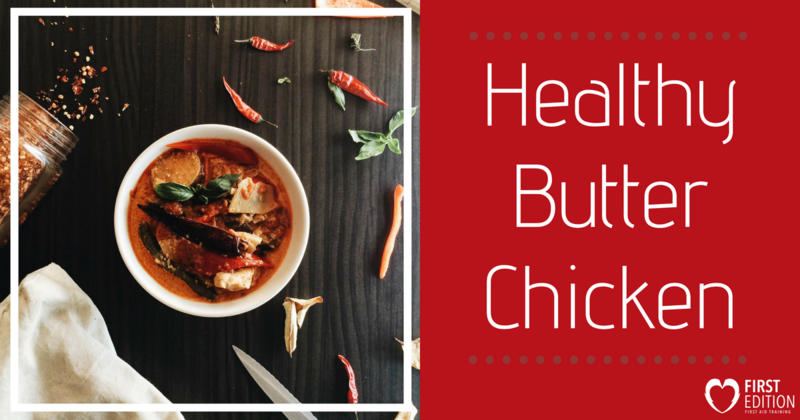 Try this healthy butter chicken recipe that you can make in the slow cooker! The recipe is a mixture of various spices as well as low-fat ingredients, to protect you from those heavy sauces we are accustomed to. Simply throw most of the ingredients in a pot first thing in the morning, and you will have a delicious and healthy, butter chicken dinner waiting for you when you get home! Not to mention, it will be hot and ready to warm you up! Before you order off of SkipTheDishes or open that Ubereats App, why not try a healthy version on your own – one you can feel good about! NOTE: Would you prefer a vegan butter chicken? Choose to add more vegetables and tofu instead! Combine onion, garlic, all of the spices, and the tomato sauce into your slow cooker. Mix the ingredients until they are combined. Stir in the cut-up chicken into the slow cooker mixture. Turn your slow cooker on low for 6 hours (or on high for 4 hours). Twenty minutes before you are ready to eat, place the non-fat yogurt into a separate bowl. Begin to add the hot tomato sauce to the yogurt, 1/4 cup at a time, stirring continuously. Once you have made about 2 cups of the yogurt-tomato sauce mixture, pour it back into the slow cooker. Stir to combine. Cook the butter chicken for another 15-20 minutes, or until the mixture is heated all the way through. Serve with lime and cilantro garnish, and rice. Enjoy! Coming home to a hot pot of butter chicken is sure to brighten your day! Thank you to thekitchenpaper.com for the healthy recipe!